A new report by Persistence Market Research studies the different aspects of the global operating tables market for an eight year forecast period from 2017 to 2025. The report incorporates historical data of the global operating tables market for the period 2012 to 2016 and estimates revenue projections for the forecast period 2017 to 2025. An extensive process comprising primary and secondary research has been followed to arrive at the pertinent market numbers. Metrics pertaining to the global operating tables market such as market size, Y-o-Y growth, basis point share, absolute $ opportunity, incremental $ opportunity, and market attractiveness index have been derived after validating data acquired through thorough secondary analysis with extensive primary discussions among key market stakeholders. Data thus obtained is validated using the triangulation method that is essentially an integration of primary and secondary research data along with Persistence Market Research analysis to arrive at the final data points. This data is scrutinized using advanced tools to obtain qualitative and quantitative insights into the global operating tables market. Persistence Market Research leverages sources such as LinkedIn, Zoominfo, Salesforce, and Avention for primary research. Secondary research sources include company websites, company annual reports and financial reports, company white papers and press releases, and paid publications such as Factiva, GBI, Genios, and Meltwater. This report titled ‘Operating Tables Market: Global Industry Analysis 2012 – 2016 and Forecast 2017 – 2025’ is a detailed study of the global mobile operating tables market and includes Persistence Market Research analysis and recommendations pertaining to the overall market approach, target product type and region to focus on, and the differentiating strategies of key players currently operating in the global market. The report begins with an executive summary, market introduction, and global market view point. The market view point section includes an analysis of the macroeconomic factors anticipated to influence growth of the global operating tables market, an opportunity analysis of the global market, PESTLE analysis, installed base analysis, and a list of distributors currently prevalent in the global operating tables market. The regional operating tables markets are covered in a separate section, where Persistence Market Research studies the performance of the operating tables market across the assessed geographies. These sections include information such as key regional regulations and pricing analysis, regional market dynamics (drivers, restraints, trends), historical and current market size and forecast by country for the different market segments, and a list of key representative market participants. The report on the global operating tables market features some of the leading companies having business operations in the global market. An entire section is devoted to studying these companies. Information such as market structure, company market share analysis and a competition intensity mapping by market taxonomy is presented in this section. In addition, Persistence Market Research has profiled the top companies and presented information on their business overview, key financials, growth and expansion strategies, and recent market developments. There has been a gradual shift from manual operating tables to more sophisticated operating tables incorporating the latest technologies such as hydraulic and electro-hydraulic powered tables with battery systems and locking drawers to allow skilled operating theater staff to access the operating table drawers. The development of more advanced powered as well as hybrid operating equipment that can auto-adjust is likely to create new opportunities for manufacturers of operating tables in the global market. Newer and more advanced operating tables serve to increase the efficiency of the surgical process and are being increasingly preferred by surgeons across the world. The development of pressure distribution mattresses will prevent unintentional injuries to patients during operations and these are also witnessing a growing demand among the global surgeon community. Highly advanced operating tables powered by the latest technologies improve the working ergonomics of the surgical team and demand for this equipment is expected to increase considerably in the coming years. Of the three types of technologies implemented in operating tables, the Non-powered/Manual Operating Tables segment is anticipated to be in higher demand, resulting in an increased revenue share throughout the forecast period. This segment is estimated to reach a market valuation in excess of US$ 550 Mn by the end of the forecast period in 2025. The Non-powered/Manual Operating Tables segment is projected to be the most attractive in the global market, with an attractiveness index of 1.4 during the forecast period. 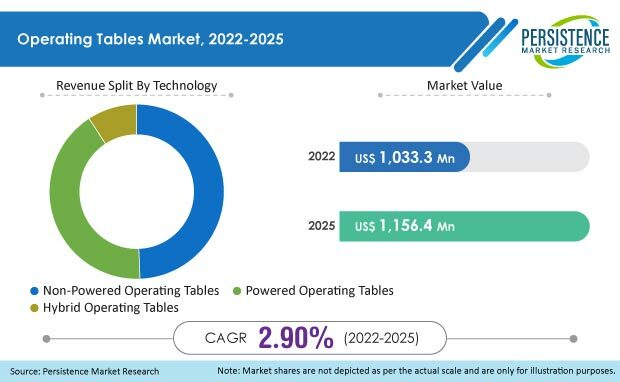 Powered Operating Tables is the second largest segment by technology in the global operating tables market, with a market valuation of over US$ 470 Mn by the end of 2025. However, the Hybrid Operating Tables segment is projected to be the fastest growing segment in the global operating tables market, and is expected to exhibit the highest segmental CAGR of 4.6% during the period of forecast (2017 – 2025). North America: Advancements in technology and process development are facilitating the introduction of innovative products in the North America operating tables market. Operating tables and operating lights are designed keeping the needs of surgeons and patients in mind and with surgical methods becoming more specialized, the operating room and relevant equipment is also becoming more advanced. Key players across North America are launching innovative operating tables to grab a large share of the market. Further, the adoption of hydraulic and electro-hydraulic operating tables is trending the North America market. Powered operating tables are witnessing increasing demand across the region owing to the convenience in terms of ease of use and reduced surgery time offered by these tables. Latin America: The use of modular operating tables is shifting the dynamics of the Latin America operating tables market. Modular operating tables increase surgery efficiency by reducing the reliability on additional accessories. Europe: Multi-functional operating tables are revolutionizing the Europe regional market. Over the last few years, leading hospitals across Europe have been moving away from using different types of surgical chairs, tables, and stretchers used to perform surgical procedures towards using a single table system that can be used for different surgical procedures. These all-in-one systems include a range of extensions and accessories that can help surgeons perform different types of surgeries. These tables also have dedicated trolleys that can be used for day-to-day transfer. Asia Pacific: The Asia Pacific operating tables market is characterized by innovation in surgical robotics to ensure better efficiency. There is a growing demand for high load bearing operating tables and specialized tables for neurology and cardiac surgery across this region. Middle East & Africa: The adoption of technologically advanced operating tables is a key development in the MEA region. Healthcare institutions across the region are deploying automatic, remote-controlled operating tables to provide superior surgical services to patients. The addition of C-arm imager, robotic arms, and radio translucent operating tables is the latest innovation in the MEA operating tables market. Famed ?ywiec Sp. z o. o.